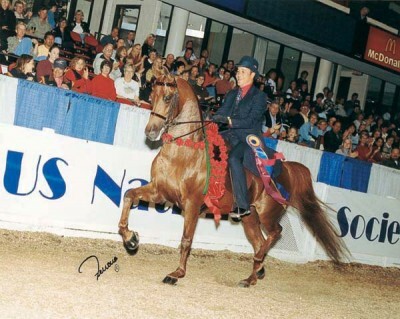 A lovely chestnut mare by Cedar Ridge Arabians’ stallion Brass and out of the Saddlebred mare Harlem Queen, Ames Queen dominated the Country English Pleasure division during the late 90s and early part of the current decade. In 2000 she was at top of her game, capturing the Region 9, Canadian National and U.S. National Championship amateur titles, all with late owner Russ Vento aboard. She won the U.S. title again in 2001. The two made an incredible team.